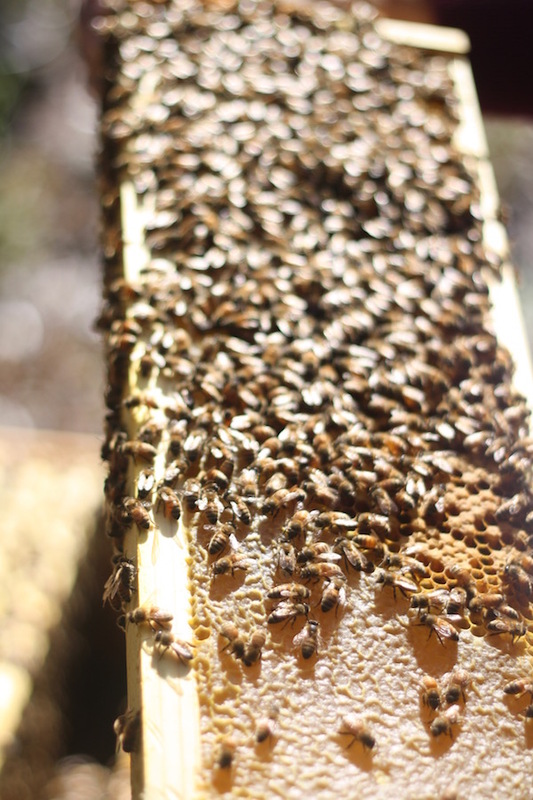 In other news, this week's Local Food Report is another honeybee spotlight: this time a conversation with a Wellfleet beekeeper working to breed honeybee queens adapted to our Cape Cod climate conditions and resistant to the menace that is varroa mite. You can listen over here. 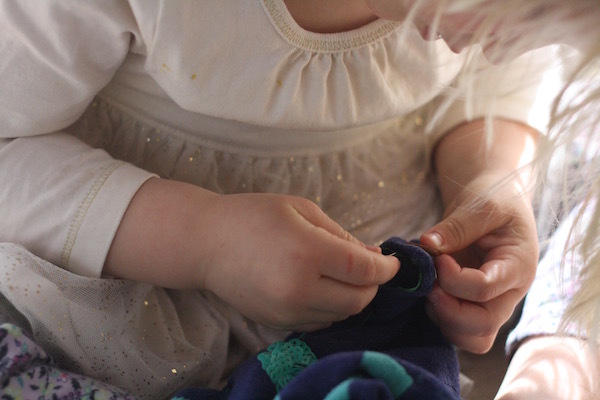 And while we're on the topic of hope: there is nothing more endearing and rewarding than encouraging and allowing little hands to be helpful and responsible and to move with purpose. This is a note to my future self: a reminder of the importance of this for those times when it feels too slow or too tough. It is not the easy things that are the most rewarding, for us or for them. Finally, if you're in the kitchen this week, these latkes are a killer way to use up the last of the potatoes. 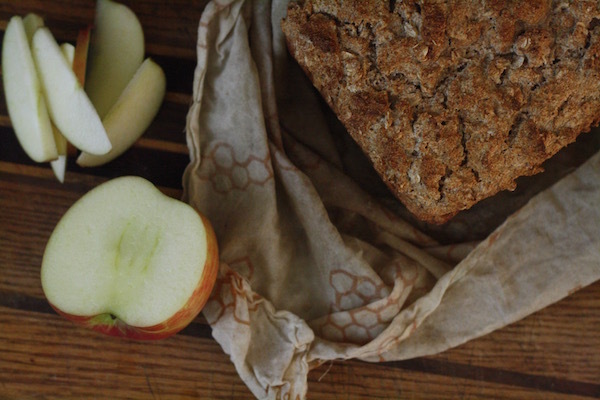 The apples at the grocery store have been terrible lately but also cheap—homemade applesauce is a thrifty way to put them to good use and makes an excellent addition. For tomorrow I'm marinating a batch of lamb loin chops and thinking of going hunting for watercress that grows at a friend's house along the Herring River. Spring ! I think it's really here. I'm reading a book my sister recommended, a book that I suppose stores or libraries would file under "self-help," though I'd call it part memoir, part advice, and part history. It's called "Drop the Ball," and it's by a powerhouse of a woman named Tiffany Dufu. I can't say I agree with everything in it—it is tailored to a kind of working woman that in many ways I don't really aspire to be—but still, it resonates. I think that for modern women, and especially working mothers, it's a valuable read. It continues the discussion on how women can navigate dual roles as caregivers and breadwinners—the myriad ways we as a society elevate competitive work and devalue caregiving roles—and how and why we promote the myth that anyone can have or do "it all." (More good writing on that here, here, and especially relevant to the most recent branch of that conversation here.) There is one part, in particular, though, that I really like, and that is about cultivating happiness habits. It sounds a little silly when you type it out like that, and it is a little silly that we grown ups have to remember to regularly practice and value activities that bring us joy. It ought to be natural—and for kids, I think, it is—but as we grow up we are slowly taught to squelch and put-off and achieve and go forward. And that is important, of course, but so are the small and sometimes strange things that constitute happiness habits. One of the things that gives me joy is allowing myself time to be curious. 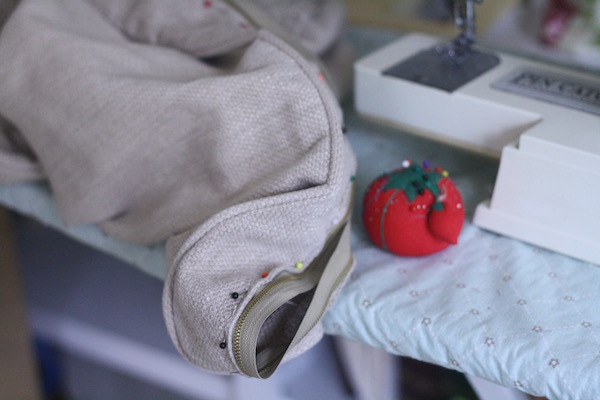 I am curious about all sorts of random things: can I learn how to fix the zipper on our couch? How would I do it? Would it be hard? What it's like to grow cabbage? Does the Herring River flow in both directions where it connects to the kettle ponds, depending on the tide, or is it always pushed back at a certain point from overflow from springs? What makes the peepers start? Does it mess up your hips to ride side saddle? The questions never end, really. I suppose this is why I work as a journalist: some of the time, at least, the process of finding answers to these questions is paid. But it's just as important, I think, to sometimes indulge them simply for the happiness of the habit, for the joy that is cultivating curiosity. 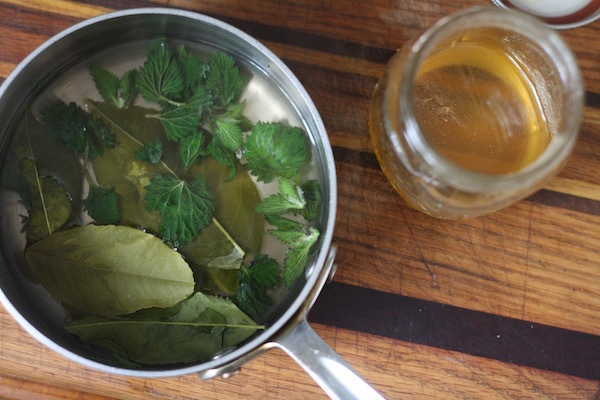 And so: have you ever made a cup of nettle tea? 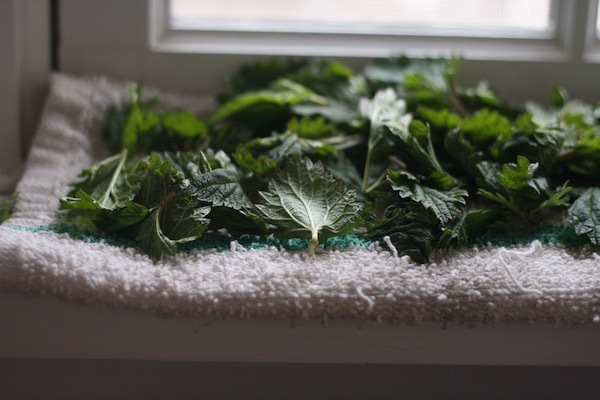 I learned about stinging nettles as a food source a few years ago, first from my friend Ish and later from a woman named Fiamma. The leaves are packed with vitamins and minerals—in particular magnesium and calcium—and this time of year, they're just what we need. They're up—we saw some yesterday on an Easter walk along the Herring River to see if the fish were running (we didn't spot any)—and I picked a few and put them on a cutting board to dry out, to use for tea. I used to buy nettle tea when I was breastfeeding—it's said to increase milk production—and I got to like the woodsy, licorish-laced flavor. It's nice with mint or lemon leaves and a little bit of honey. It turns out the longer you steep the leaves the more nutritious the tea, so I started a pot this morning and let it sit til lunch. 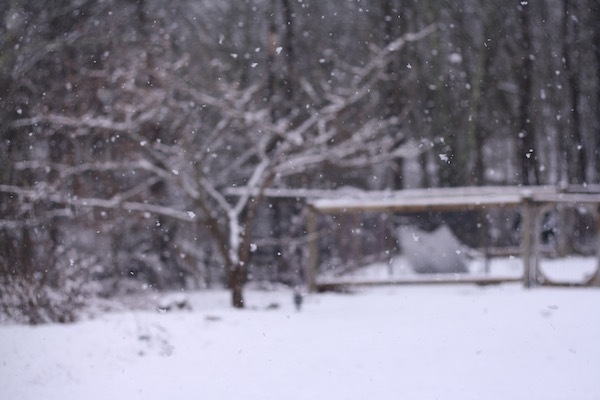 By the time I went to drink it there was an inch of snow on the ground to follow the weekend's sun and fifty degrees—a wet, white invasion I find simultaneously lovely and appalling. 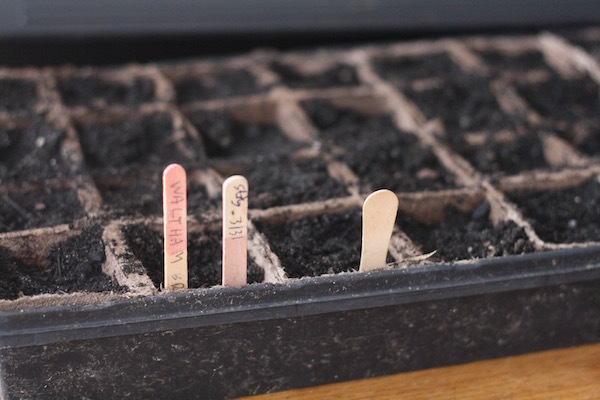 On Thursday I put spinach in the ground and lettuce and radishes and sugar snap peas. Will they make it? Probably. It's nice to wonder, though, and to revel in the curiosities. 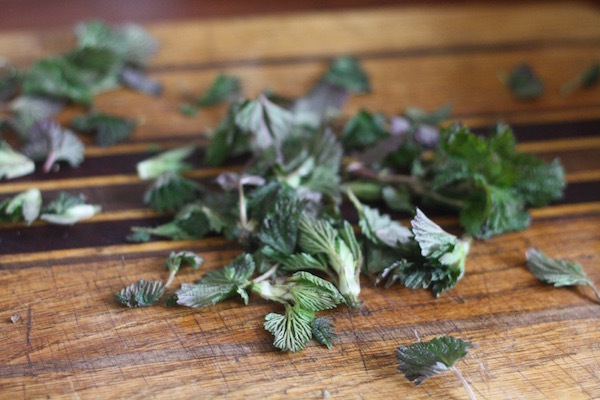 You don't need a recipe for this, but you may need a guide to looking for nettles. They come up around the same time as the crocuses. Here are pictures I took of the leaves. They tend to grow in disturbed areas—think about where you've seen garlic mustard or blackberries or simply look along the side of the road for something with spiky leaves that's deep green. I've found them close to water sources but not in them—maybe 10 or 20 feet away. Think roads near rivers, streams, and fresh water swampy areas. And if you don't see any right away, don't give up. Once you find them you'll start seeing them everywhere—they are a true weed. As for the tea, pick a bunch of leaves and leave them out on a cutting board overnight to dry. Put them in a jar and when you want to make tea grab a handful, put them in a few cups of water, bring to a boil, and turn off the heat. Steep for 2-10 hours (overnight would be fine)—I like to add either fresh mint leaves or dried leaves from our Meyer lemon tree. Serve piping hot, with a spoonful of honey. P.S. AHH! I almost forgot to add: they're called stinging nettles because they sting!! Use gloves when you pick or your hands will get red and sore. The stinging feature goes away when the leaves are dried out or boiled, so after that you don't need to worry.